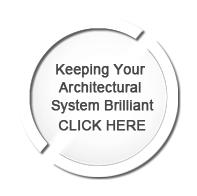 G+MC’s entrances systems are architectural systems built for function, built to last – offering some of the most impressive, artistic designs in the country. Partnering with Edwards Glass Company, Glass + Mirror Craft engineered and fabricated two new all glass entrances for the Clements Library. The first glass entrance – a freestanding all glass vestibule – offers a full view of the landscape with a sleek, clean, modern touch. The structure features laminated glass panels and a panic glass door supported by all glass fins and beams. The hardware including the portal were all custom built by GM+C’s metal division Cuda Metals. 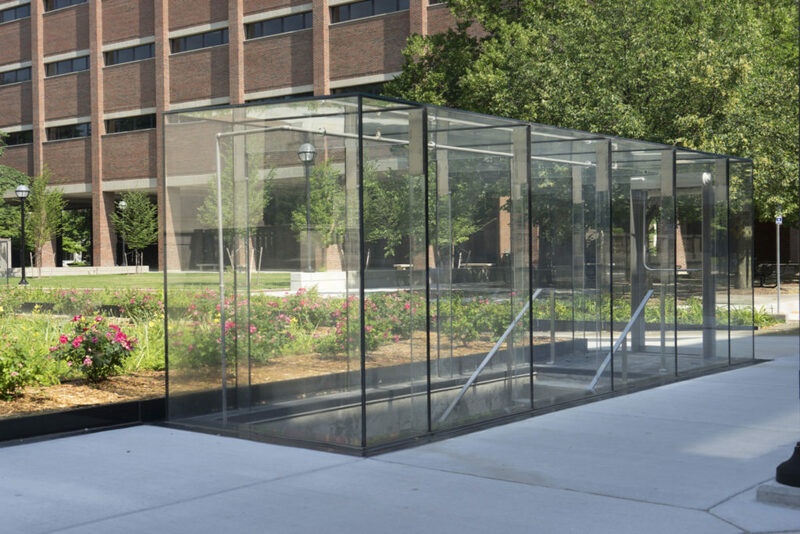 G+MC also delivered a three-wall all-glass structure serving as an entrance to the library building. Together, these two architectural systems further enhance the beauty of the campus. Glass + Mirror Craft provided several custom architectural systems combining glass and metal components for this building design of the esteemed Cesar Pelli. A key element was a screen-printed glass wall following the primary traffic corridor in the building’s piazza. Glass + Mirror Craft also supplied the glass panels and stainless portals for several swing door entrance systems throughout the main floor of the complex. The client was pleased with G+MC’s single source solutions, and valued the level at which we merged art and function into a singular design. out the architectural system capabilities of Glass + Mirror Craft. G+MC designed, engineered and fabricated a fully custom, point-supported glass curtain wall for maximum transparency. Advanced technology and carefully managed calculations delivered 20-foot all glass walls, all glass doors, and clean 90 degree corners – enveloping visitors in stunning floor-to-ceiling glass. 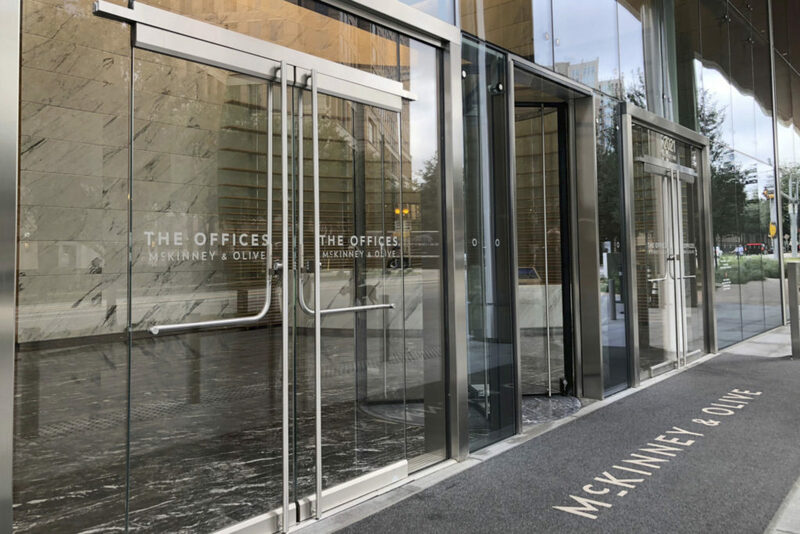 G+MC designed and provided the custom stainless steel hardware for the curtain wall’s point supported system, along with the stainless metalwork surrounding the vestibule’s portal. Glazier Glass Solutions retained Glass + Mirror Craft to provide the primary elements of the all glass entrance to the 203 North LaSalle office complex. This point-supported architectural system – consisting of a custom glass structure wall with glass and metal canopy – creates a distinctive face to the building, allowing daylight to enter the interior space to highlight the design. 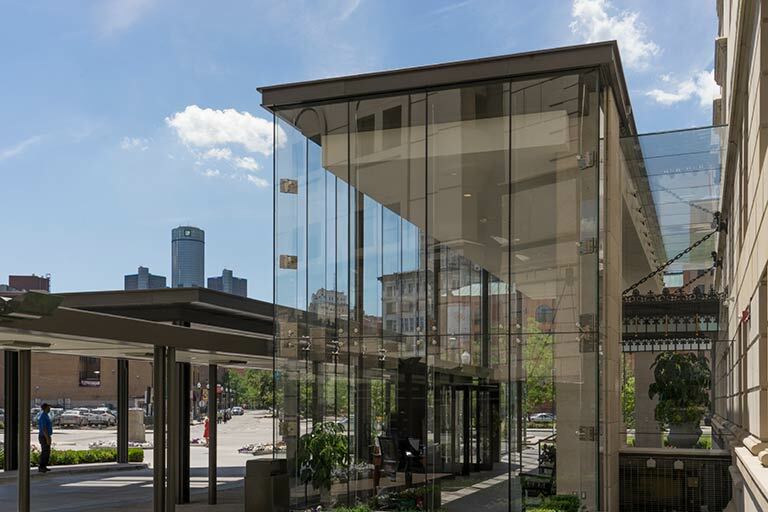 Within, G+MC provided all glass guardrails on the open second floor of the building, along with an all glass entrance and glass partitions separating a fitness center to floor traffic. 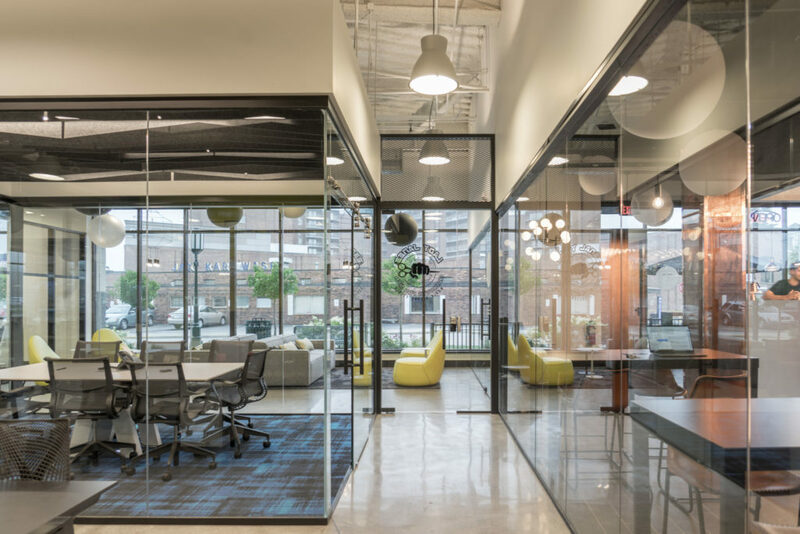 Underscoring its capabilities in architectural systems, G+MC fabricated the all glass entrance, glass walls, and glass offices and doors, collectively allowing natural light to flow through the space showcasing its modern elegant design. A freestanding all glass office serves as a central meeting space. Glass + Mirror Craft recently partnered with Glasco Corp. on the new (and only) Ferrari dealership in Michigan. 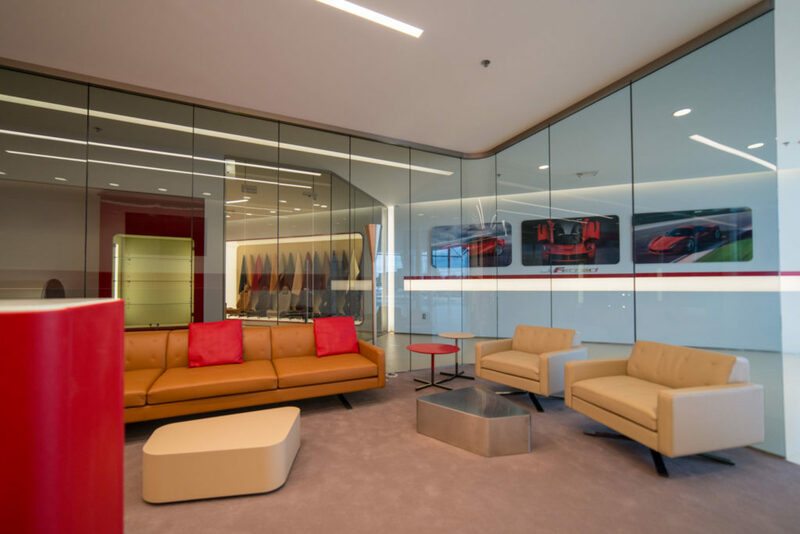 Working within stringent brand quality expectations, G+MC was challenged to design, engineer, and fabricate a series of sales offices consisting of laminated glass panels and laminated glass doors, both in a specific – and, for laminated glass, challenging – Ferrari grey color. The corners of the offices featured 90-degree curved laminated glass. G+MC also provided a laminated all glass entrance system to the venue. All of these architectural systems feature custom G+MC metal hardware. stainless steel supports, door handles, and other hardware. A glass and metal entrance system allows light to grace a central walkway along the offices. 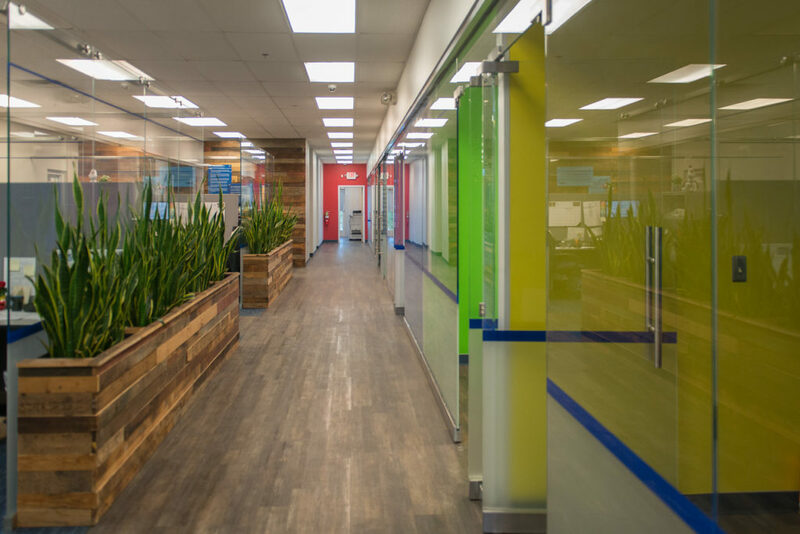 The colorful space utilizes custom painted, fritted, and etched decorative glass. It also includes a custom stainless steel and glass structure front desk. A visit to Glass + Mirror Craft is a virtual tour through our creativity and craftsmanship in architectural systems. 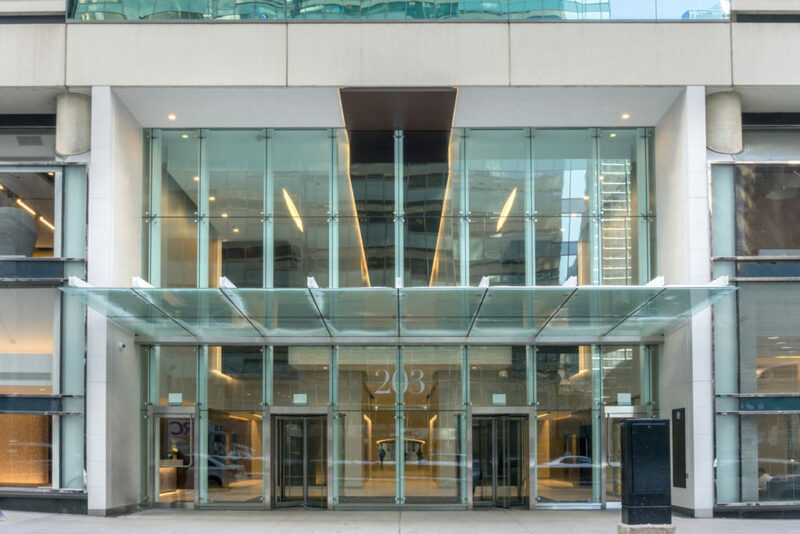 Working with Chicago-based glazier Glass Solutions Inc., Glass + Mirror Craft fabricated a custom exterior vestibule for this upscale residence building in the city’s downtown. The architectural system featured screen-printed laminated glass and custom stainless steel hardware. Prominent cladding outlined the vestibule, adding appropriate distinction. Dual custom panic doors provide security.